Robin Rue Simmons sits at a May meeting of City Council. The new 5th Ward aldermen has numerous ambitious plans for Evanston and her ward. Robin Rue Simmons was a newcomer to Evanston politics before she won the 5th Ward’s aldermanic race earlier this year. She ran her most recent business, Signature Construction Services, for seven years before she began her campaign for alderman. The company was started initially as a decorating business, but evolved into a construction company, Rue Simmons said. Rue Simmons’ involvement in politics began through participation in activism. When she returned to her hometown in the early 2000s, she said she began to take part in civic engagement and activism in the city. Upon learning that former 5th Ward alderman Delores Holmes was retiring, she decided to launch her candidacy. Simmons was endorsed by Holmes, as well as by the Evanston chapter of Reclaim Chicago, a political organization that endorses candidates for political offices in and near Chicago. Tyler Darnell, who worked at Reclaim Chicago during the aldermanic race, said he helped Rue Simmons with her campaign. “I helped her with fundraising and ran events and worked on her field program, as well,” Darnell said. Rue Simmons ultimately beat out Carolyn Murray in the 5th Ward race, despite a controversy during the campaign in which Evanston residents sued Rue Simmons’ company for allegedly not completing a home renovation contract project. Janet Alexander Davis, who helped organize Rue Simmons’s campaign, credited Rue Simmons’ win to her charisma and public speaking skills. One of Rue Simmons’ biggest focuses during her campaign was improving access to education in the 5th Ward. Although she commended Evanston/Skokie School District 65, she also said that she hoped to expand the educational resources available. Rue Simmons praised the work of the YMCA and educational institutions besides D65 schools, and discussed the possibility of other educational organizations coming to the area. Another platform of Rue Simmons’ campaign, and something she currently is focusing on, is the development of affordable housing. She said hopes to create affordable housing throughout Evanston to reduce what she described as de facto segregation in the city. Rue Simmons said she planned to work with the other aldermen to spread accomplish her affordable housing goals. She said she believes that Evanston’s affordable housing fund, which was expanded last year, will provide a foundation for putting such a plan into action. 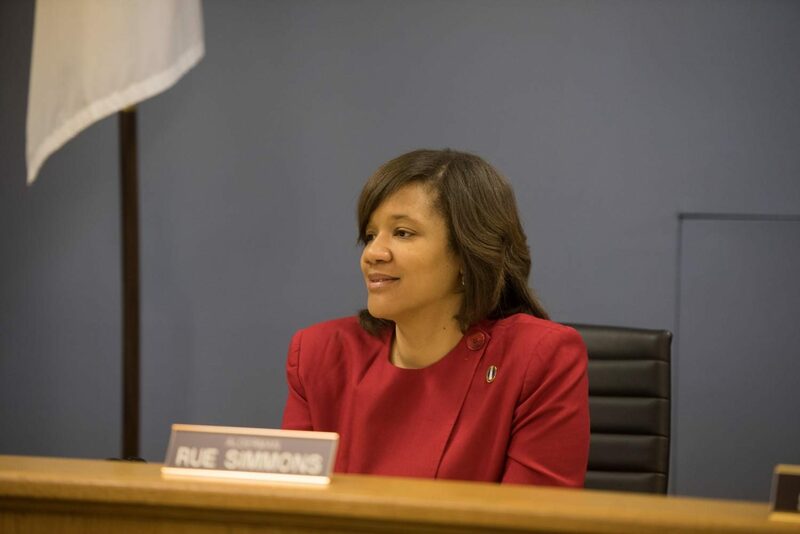 “I am looking forward to working with my colleagues on City Council to come up with a thoughtful and strategic plan to expand affordable housing city-wide,” Rue Simmons said.